What makes you come alive? What do love doing so much, that you can't think about anything else when you are doing it? Amy Krouse Rosenthal shared a quote by Howard Thurman in one of her TEDx talks, "Don't ask yourself what the world needs; ask yourself what makes you come alive. And then go and do that. Because what the world needs is people who have come alive." (Beliefnet.com). 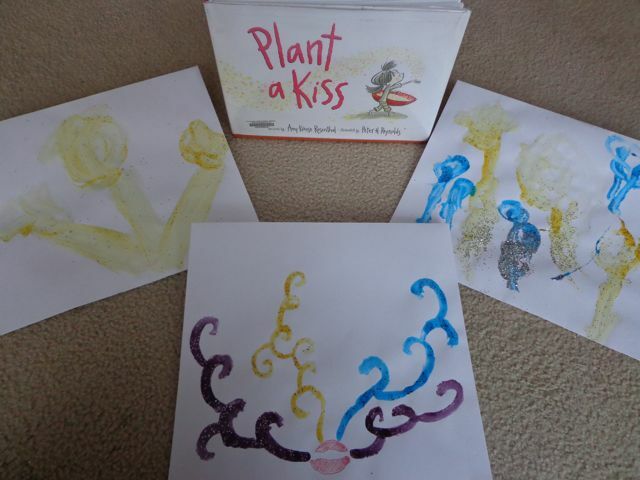 I am borderline obsessed with creating activities that bring picture books to life. I realized after I heard the quote from Howard Thurman that I continue to write this blog and dream up activity ideas because it makes me come alive. I love the excitement of a new idea, seeing the joy on my childrens' faces when they are engaged in an activity, and sharing our reading experiences with you. Have you thought of what makes you come alive? Amy Krouse Rosenthal simply suggests that once you know, you should "go to it." Amy Krouse Rosenthal said, "words, ideas, and making things" make her come alive (TEDxWaterloo 2010). She is an author, filmmaker, and is a contributor to NPR and various other media outlets. 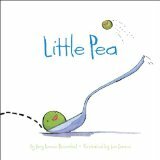 She published her first children's book, Little Pea in 2005 (Which I can't believe I didn't read to my children before this celebration!?!) and since then has written over 20 books including recent New York Times Best Sellers Plant a Kiss illustrated by Peter H. Reynolds and Exclamation Mark illustrated by Tom Lichtenheld. I became familiar with Amy's work by watching her short films on YouTube, specifically The Beckoning of the Lovely 8/08/08 and The Money Tree. It is inspiring to listen to Amy speak (please watch her TEDx videos), delightful to read her books, and exciting to think about what she is going to create next! In her TEDxSanDiego 2011 talk, entitled The Crevices of Life, she encourages us to wander, "the simultaneous act of being idle while being wide eyed" and not squander our time. Her belief, from experience, is that "wandering leads to some gift in the end." In a book store in Barcelona the book El Hilo De La Vida by Davida Cali and Serge Bloch caught her attention. She bought the book and loved it even more after someone translated it for her. A few days later, after arriving back in United States, she received the same book, I Can't Wait, only in English this time, from a friend with a note, "I saw this and I immediately thought of you." (Click here to learn more about Amy's special friend.) Some might considered this to be a coincidence, but Amy believes it was a bit of "magic". One of my favorite quotes from Amy may also help explain this event, "Whatever you decide to look for you will find. Whatever you beckon will eventually beckon you." (TEDxWaterloo 2010). Fast forward to this year, Amy's latest book, just released on April 9, 2013, I Scream Ice Cream! : A Book of Wordles, is illustrated by Serge Bloch, the same illustrator of those two books that found their way into Amy's life. I Scream Ice Cream! is a book of wordles. So what is a wordle? Amy Krouse Rosenthal defines them as, "a group of words that sound exactly the same but mean different things." Our favorite wordle in the book was "A family affair. A family of hair." Serge Bloch's illustration of this wordle is hilarious as are many of the illustrations in the book. I highly recommend this book and think you will enjoy trying to guess the second wordle in the pair before you turn the page. In addition to I Scream Ice Cream!, my family spent the entire month of April reading almost all of Amy Krouse Rosenthal's books. As we read each book, activity ideas were popping into our heads. We were having a hard time picking just one book to focus on for a birthday celebration activity. When this happens, my creative juices really start to flow (I start to come alive!) and I decide to put a little more time and effort into making a reading experience packet that can be used in classrooms, libraries, or homes. Below you will see the books we read and the activities we did to bring the books to life. 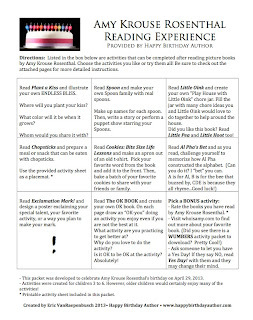 After you have a chance to look at all the photographs make sure you download the Amy Krouse Rosenthal Reading Experience Packet. It includes an activity grid, step-by-step instruction sheets for each activity with many photos, and many printable activity sheets. I hope you enjoy it and please share this FREE resource with others! 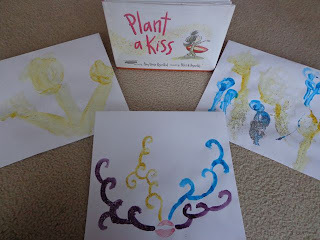 Read Plant a Kiss illustrated by Peter H. Reynolds. Illustrate your own "Endless Bliss". I provide two illustration methods to make this happen. Read Spoon illustrated by Scott Magoon. 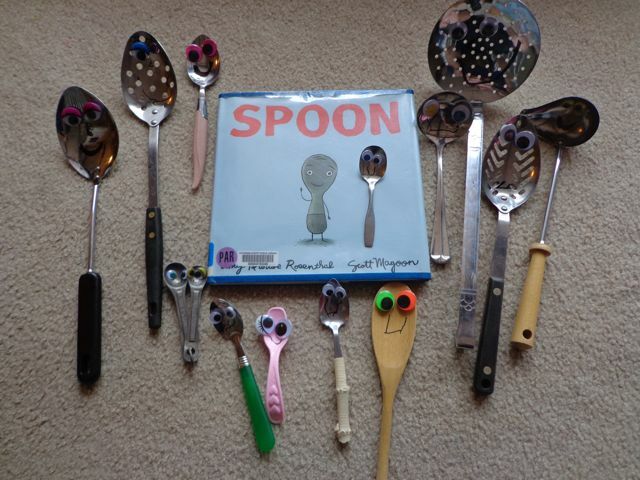 Create your own Spoon family. We found many unique spoons at the thrift shop and added googily eyes and smiles! Read Little Oink illustrated by Jen Corace. 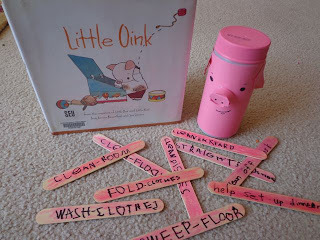 Little Oink does not like "Mess up time." Create a Little Oink chore jar to motivate kids to clean up the house or classroom. 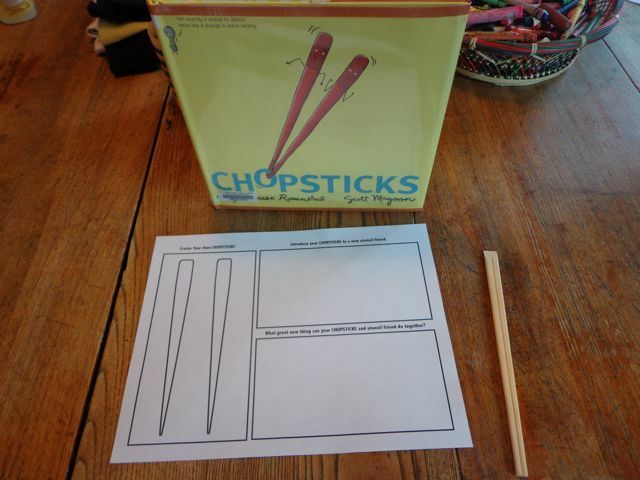 Read Chopsticks illustrated by Scott Magoon. Use chopsticks to eat a snack or meal. The provided activity sheet can be used as a place mat. 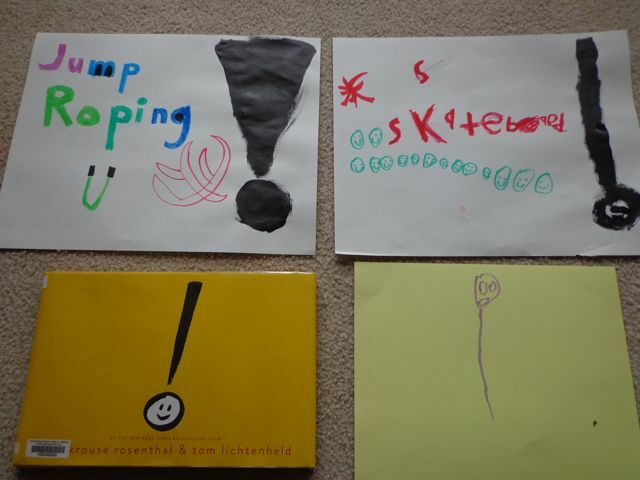 Read Exclamation Mark illustrated by Tom Lichtenheld. Illustrate your own exclamation mark and exclaim to the world your special talent, favorite activity, or the way you plan to make your mark. Read Cookies: Bite Size Life Lessons illustrated by Jane Dyer. 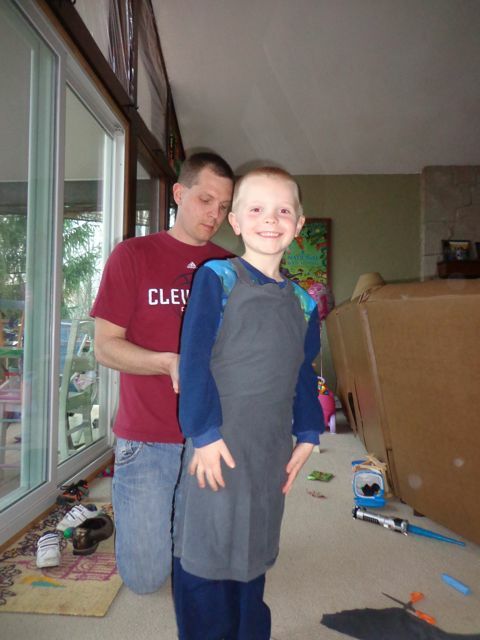 Make an apron out of old t-shirt. Bake a batch of cookies to share with your friends or family (and show off your new apron!). Read The OK Book illustrated by Tom Lichtenheld. 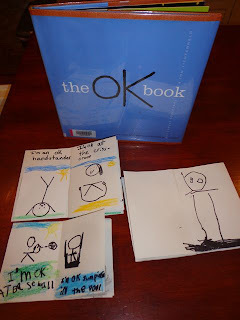 Create your own OK mini-book. Instructions for folding the book from one piece of paper are included in the packet. Plus more -- a challenge for Al Pha's Bet and a "Rate the Books You Read" worksheet! Click Here if the link doesn't work! Thank you Amy Krouse Rosenthal for your insight, creativity, and passion that is helping so many people reach their full potential.